Front cover pic by Marcus Bläsing mb@homeishome.de / homeishome.de, shot at Home Event / MTW Offenbach 11-april-2009; slideshow pics by Clark Cammann, Sandro von Keller, Elle P, MS & some unknown friends and clubbers around the club globe. if you see a picture here that you took please send me your name and we will add it. This site is not a promotional website nor is it a new Schaffhäuser or Ware website. It represents, or rather it IS my new live album “In Concert”, which can be listened to and/or downloaded without any registering or other data assessment. 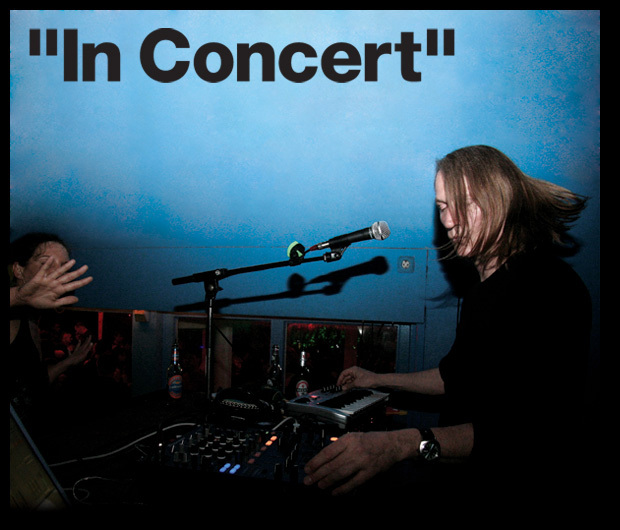 The idea for “In Concert” goes back to my first concerts in 2008 when I realized that this concept would just have to be recorded one day – it was such great fun right from the start and in this techno house circus I dare say, this is rather unheard of. Especially, however, because I gradually added more and more vocals and instruments to the set (a bluesharp, a melodica and percussion), which led to ever more specialized versions. Around 70% of the concert you can listen to here was recorded at the club “Ilses Erika” in Leipzig, where I performed as part of the Popup Festival 2010. Some bits and tracks are taken from live gigs at the Zenzi Club in Mumbai (India), Maria am Ufer in Berlin and from the Suxul club in Ingolstadt. They were chosen simply because there was something special to them or because the Leipzig recording had dropouts or other little glitches that needed to be replaced. Other than that, there are no additional overdubs or corrections; the club vibe and the slightly rough sound were to stay intact. Only the vocals on “Confusion / Hey Little Girl” have been doubled as I couldn’t find a single recording on which my voice was loud enough. But even here, it was done without the usual studio tricks. Under “free download” you can not only find the entire live album, but also a pretty little make-it-yourself CD booklet for those who like to stick something on their shelf they can actually touch. Along with this free album, Ware releases “In Concert EP 1” with an alternative live version of “Lost In The Pile / Well”, a one-track medley that I released with Alex Smoke in 2009, and the old blues piece “Well (Baby Please Don’t Go)”. In addition to my live version there are remixes by the Cologne-Berlin techno super gang Brandt/Brauer/Frick, Paulice from Argentina (Adjunct Rec.) and by Pedramovich (Mixed In Sheffield Rec.). In March, look forward to “In Concert EP 2” with a new version of “Nice To Meet You” and several remixes by Markus Guentner and others. Links to the shops where you can purchase these EPs are listed under “buy”.